All sales final after item has shipped. If you receive a damaged item, we will replace it for free, including shipping. Our business is based on our reputation. We will do our best to make things go as smoothly as possible by setting expectations early. Part of this is the personalized phone call during booking when we go over what to expect in an appointment and to see if what we provide is what you are looking for. Please ask questions during scheduling so you can be fully prepared for the appointment. The other part of this is to establish the terms as defined below. Payment must be received and cleared no later than 24 hour prior to your appointment. Full refund if cancelled 24 hours prior to appointment. 100% cancellation fee if cancelled less than 24 hours prior to appointment. Satisfaction guarantee: You may end the appointment during the first 10 minutes and receive a full refund. If you continue after 10 minutes, you are agreeing that the service has been provided and the sale is complete. Service are based on time. Unless otherwise negotiated, your appointment will last the agreed upon time (30 minutes or 60 minutes). The service may go a little longer, but will not cost more. For telephone calls, the appointment may start up to 15 minutes after the appointment time. If you do not hear from us during that window, please contact customer service by telephone or booking@allisondubois.com. If we receive your call or message during the appointment time, we will reschedule your appointment. If we do not hear from you, your appointment will be cancelled with 100% cancellation fee. All calls are recorded and sent to you. If you wish to not be recorded, please let us know at the time of booking. The recording is kept confidential and will not be used publicly without your expressed permission. The recording quality is not guaranteed. Please keep written notes of important things you do not want to forget. 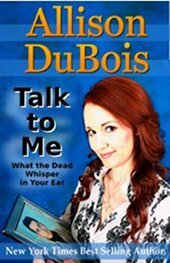 The recording remains the property of Allison DuBois, do not sell it or otherwise make money with it. Of course, you may share it with your friends and loved ones as you see fit. All content on this website is copyright Allison DuBois. These terms may change at anytime. Allison DuBois will retain the rights to all content at all times and may revoke license for the use of any content at any time for any reason. This content is meant to help people, and for that reason, you may personally share, for free, the videos, FAQs and quotes online, but only if you include a link to www.AllisonDuBois.com or directly back to the original content. You may not make money off of this content, so please do not share any content on a paid platform or in conjunction with advertising that you get a profit from. Also, you may not share in any material or physical form, such as on merchandise, posters, books, dvd’s, etc. We currently do not host outside advertising on this website. Any information you enter will be held private to the best of our ability. We do not share or sell your information. We will only email you if you ask to be on the newsletter list or if we have an issue with your order. We use google analytics and their associated cookies to get to know our audience. This allows Allison to create new, and often free, content that is geared toward your interests. We do not get personal identifiable information from this. We do not share or sell this information to or with any third party.